Sierra Gladson, Jerome Goggles, David Gray, Jacob Green, Patrick Groethe, Jamal Hans, Gage Harper, BreEnna Heil, Joseph Hemme, Alyssa Hunter, Benjamin Loya, Danell Marcus, Caleb Massie, Michael McCrossin, Andrew McKinley, Kylah Meyer, Ali Moore, Elizabeth Moore, Katherine Norton, Justin Palmer, Jeffrey Peterson, Matthew Reichert, Brandon Sala, Danna Schamel, Ramon Slater, Daphne Slagowski, Thomas Trout, William White, Jr.
EWC Alumni golf team participated in the 27th annual EWC Foundation Golf Tournament. Left to right: Tyler Severin, Robbie Shipp, Cayl Carpenter, and Garrett Mortimore. The Eastern Wyoming College Foundation hosted its 27th Annual Golf Tournament and Calcutta on June 17th at the Cottonwood Country Club. This year’s tournament boasted 22 teams with players traveling from across Colorado, Nebraska, Idaho, and Wyoming. The results for the tournament are as follows: first place went to the team of Lucas Moore, Steve Feagler, Kyle Nighswonger and Jim Phillip. In second place was the team of Jim Fisher, Zach Fisher, Doug Haught, and Michael Haught. Placing third was the team of Gary Childs, Julie Haught, Don Haught, and Robin Haught. Rounding off the top teams placing fourth were EWC Golf Team Alumni; Garrett Mortimore, Cayl Carpenter, Robby Shipp, and Tyler Severin. Fifth place team was Jasen Kaufman, Jayce Eaton, Duffy Sheller, and Julie Eaton. For more information about the tournament, please contact John Hansen, Director of Institutional Development at 307.532.8304. Eastern Wyoming College and the Fitness Center will be closed Tuesday July 4th in observance of Independence Day. Offices and Fitness Center will reopen on Wednesday July 5th. Eastern Wyoming College is pleased to share information on grant funding opportunities for students wishing to further their education. The first grant opportunity is the TANF-FBI Grant (Temporary Assistance for Needy Families, Families Becoming Independent). This grant provides funds for tuition, fees, books, and other required supplies for short-term training to those who qualify. The grant also pays for fees related to testing and certification in the area of study. Additionally the grant can assist with costs related to travel to a test location or to the classroom if the recipient lives in rural areas. Qualifications for the TANF-FBI Grant include: must be the financially responsible parent of at least one child (under the age of 18 years), must be a Wyoming resident, must live in the EWC service areas of Goshen, Platte, Niobrara, Weston, Converse or Crook counties, and must earn an income less than 185% of the Federal Poverty Level (according to the number of people in their home). Application and TABE (a test which indicates the student’s skill level in language, reading and math) must be completed. Proof of income is also required. Recipients will also receive training in seeking employment and soft skills required by employers. Current training programs include: CNA, CNA II, MA-C, CDL, and Plate Welding. The second grant opportunity is the TANF –CPI Grant (Temporary Assistance for Needy Families, Community Partnership Initiative). This grant provides funds for tuition, fees, books, and other required supplies for long-term certificates and degrees to those who qualify. The grant also pays for fees related to testing and certification in the area of study. Qualifications for the TANF-CPI Grant include: must be the financially responsible parent of at least one child (under the age of 18 years), must be a Wyoming resident, must live in Goshen County, must earn an income less than 185% of the Federal Poverty Level (according to the number of people in their home). Application and TABE test must be completed. Proof of income is also required. Recipients will also receive training in seeking employment and soft skills required by employers. Current training programs include: CNA, CNA II, MA-C, CDL, Plate Welding, Pre-Nursing and Cosmetology. Future training programs have been approved and include: Barbering Technician, Nail Technician, Skin Technician, Hair Technician, Child Development Certificate, Business Administration, Welding and Joining Technology, and Veterinary Technology. Funding for these programs will be available in October, 2017. Both TANF grants are provided by the Department of Family Services with the ultimate goal of helping recipients obtain jobs and end their dependence on social and/or governmental benefits. For more information on either of these grant programs or to see if you qualify, please contact Linda Day, FBI Grant Coordinator at 307.532.8365 or by email at linda.day@ewc.wy.edu. Eastern Wyoming College Athletic Director Tom Andersen has announced the academic excellence of EWC student athletes. There were 8 students athletes who earned National Junior College Athletic Association (NJCAA) Academic All American honors. In addition, 19 student athletes were named NJCAA Region IX Academic All Region. To qualify, student athletes must have 2 or more full time semesters with a minimum GPA of 3.25. “This is a real tribute to our coaches for putting the emphasis on academics and the work they do into recruiting solid student athletes,” stated Andersen. 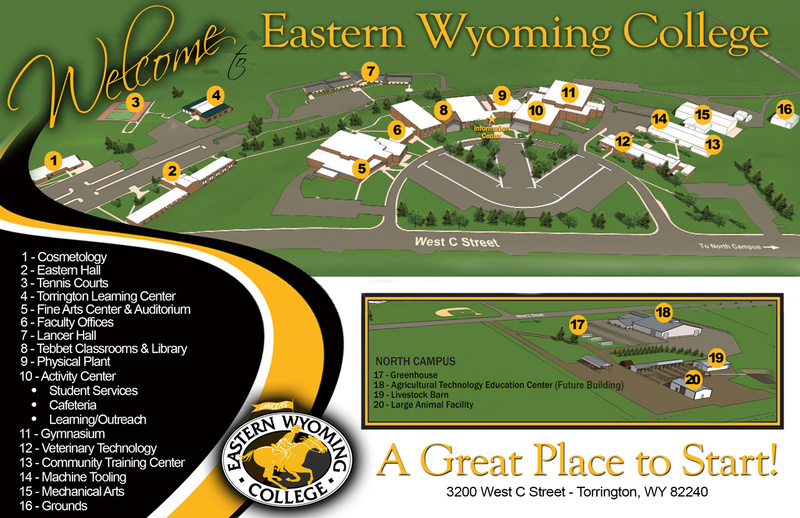 Eastern Wyoming College in Torrington announces beginning Monday, June 19, the main entrance to the campus will be closed. The alternate entrance will be the south end of Pinnacle drive near the Fine Arts Building. The closure will remain in effect for approximately three weeks. Eastern Wyoming College will be hosting a Reception to honor Dr. Richard Patterson on his retirement and welcome new president Dr. Lesley Travers on Thursday, June 29, 2017 from 5:00 – 7:00 pm. This reception will be held in the EWC Student Center and is open to the public. Recipients of the Jane E. Kreycik Memorial Scholarship recently received their scholarships from Mr. Kreycik. (left to right); Hale Kreycik, Tosha Dickinson, and Elise VanGundy. Not pictured are Chelsea Edison and Mollie Green. The Eastern Wyoming College Foundation recently awarded The Jane E. Kreycik Memorial Scholarship. This scholarship was established by Jane’s husband, Hale, to honor his wife. Four scholarships were recently awarded to Chelsea Edison, Tosha Burns, Mollie Green, and Elise VanGundy. For more information about this or other scholarships please contact the College at 307.624.7000. Photo Caption: Eleven Lingle-Ft. Laramie high school seniors commit to attend EWC in the Fall 2017 semester. Back Row: Justice Madayag, Tyler Hunt, Kyle Cruth, Taylor Wagner, Evan Engelbrecht, and Cole Morel. Front Row: Kash Kaufman, Taylor DeBock, Kaylynn Jefferson, Morea Shipley, and Johanna Church. Eastern Wyoming College welcomes eleven Lingle – Ft. Laramie high school seniors for the fall 2017 semester. The Lingle – Ft. Laramie High School College Admission Early Signing Day was held at the high school on May 17th to honor all the seniors who are moving on to college or chosen career path in the fall. Eleven of those seniors committed to attend EWC this fall. “This was a great event for us to meet and welcome our newest Lancers from Lingle-Ft. Laramie High School. We’re proud to have half of the 2017 graduating class join us at EWC,” said EWC President Rick Patterson. Six Moorcroft High School students have earned their high school diplomas, and their associate degrees from Eastern Wyoming College. MHS students Darbi Buckmiller, Brandon Clonch, Darin Fuller, Aspen Harris, Eliza Mathwig and Chase Peterson graduated not just from MHS but also from EWC with either an Associate of Arts or Science degree. These students participated and took advantage of concurrent and dual enrollment courses. Eligible MHS students may take college courses while still in high school. “Many students take advantage of this opportunity to earn college credits and get a jump start on their college educations,” stated Roger Humphrey, Associate Vice President for Outreach and Academic Services. “Through extraordinary effort, energy, dedication and focus, all six of these students completed an Associate of Arts degree from EWC while engaged in their high school studies,” continued Humphrey. Darbi Buckmiller will be attending the University of Wyoming majoring in Architectural Engineering with a minor in Art. Aspen Harris will be attending the University of Wyoming and will major in International Business. Brandon Clonch plans to attend the University of Wyoming, majoring in Business Administration. Chase Peterson will major in Kinesiology and Health Management at the University of Wyoming. Eliza Mathwig will be attending Black Hills State University, majoring in Elementary Education. Darin Fuller will be attending the University of Oregon majoring in Marine Biology. For more information about EWC credit classes offered in Moorcroft please contact Melissa Buckmiller, Outreach coordinator at 307.756.9800.